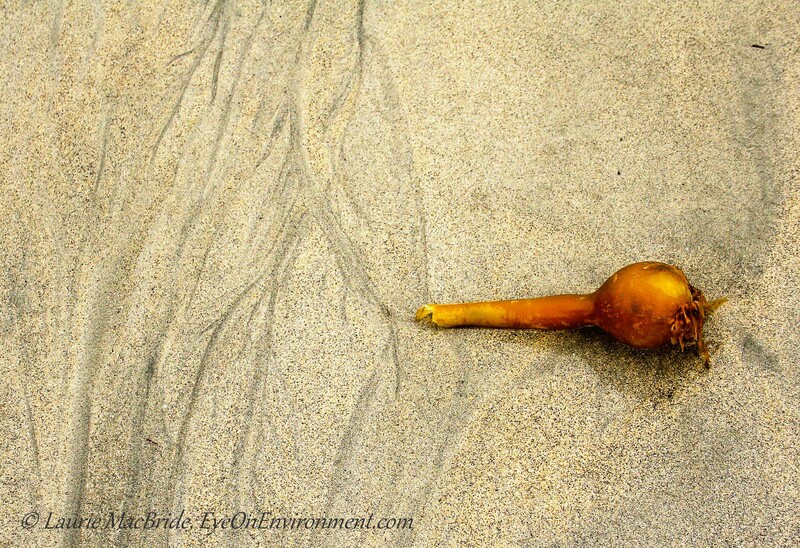 A washed-up kelp head and rivulets left by the receding tide: sometimes less really is more. I couldn’t resist trying to capture the simplicity and stark beauty of this little tableau at West Beach on Calvert Island. Along this wild, wind-swept stretch of sand on BC’s outer coast, each square foot is a microcosm of the dynamic interaction of biology and physics that takes place every day. These dynamics are complex, yet hopefully their story can be conveyed in a simple scene like this. The image above is one of the 38 prints in my recent photography show, Reflections on the Coast, which took place on Gabriola Island. In case you weren’t able to see it, I’ve made a simple video of the show (be sure to have your sound turned on, as there’s a narrative piece that goes with each image). Posted by Laurie MacBride, Eye on Environment on December 8, 2013 in BC coast, Central & North Coast and tagged beaches, Calvert Island, Central Coast of BC, nature, ocean, photos, places, shoreline, simplicity. The essence of simplicity, Laurie…I love your descriptions of your images. And I really love listening to you describe them in your own voice on the video of your exhibition. I’m so happy you shared it with all of us. It’s quite a treat to watch. Thanks so much, Sherry! Am enjoying your Simplicity Project photos.